Don’t let the first month of the year end without making a little positive progress toward some of your annual goals. If you are considering buying a home this year, building up your credit score (along with your bank account) is a great resolution to get working on. Besides, any time is a good time to work on your finances. Check your credit report. If you don’t know where your credit stands, this is a great starting point. You’ll only know what you can improve if you take a look. It can be a daunting thought but knowing where your credit stands is the first step toward repairing any issues you might have. Request a free credit report from a reputable agency, like Equifax or Experian. If you see a charge you didn’t make, an account you thought you closed in college, a creditor you don’t recognize, or another error, dispute and resolve them sooner than later. You could instantly improve your credit. Pay your bills on time. Despite the number of open credit cards you might have, despite the amounts you might owe, despite your financial situation, do your best to make a timely monthly payment on each account—that’s pay on time, every month. Even at your minimum payment, you’ll be making a concerted effort to improve your credit score. Maintain low balances. It is OK to carry balances on your credit cards, but you should keep them low compared to your respective credit limits. Using credit is great, but overspending will hurt your overall score (and borrowing potential). By all means, use your credit and use it responsibly, but do not allow your balances to climb and climb throughout the year. If you’ve used credit cards a lot in the past, try to use them less this year. Pay down current debts. Speaking of not piling more credit onto your debts, you can avoid this entirely by making a great effort to pay down current cards. There are several strategies you can use to do this. Start with a plan to target higher interest cards first or tackle low balance cards that might seem easier to make progress on. Creditors are required to be transparent on your monthly statement, which will show you just how long it will take to pay off a card if you’re only paying the minimum. If you have a high balance, high-interest card, this will surely be an eye-opener. On the flip side, creditors will also provide you with a three-year pay-off period, which might help shed some light on your current credit situation. Limit your spending. If you’ve grown accustomed to using your credit cards on a regular basis, the mere thought of not using them might seem scary, but you can limit your spending—particularly on your credit cards—by controlling a few simple factors. Start by not carrying your cards everywhere you go. Easier said than done, right? But, if you must take one, use it for emergency situations only, not daily coffee runs, lunches out, shopping or other entertainment. These things might seem like small purchases, but if you’re not paying them off each month, they can quickly add up to major credit issues. 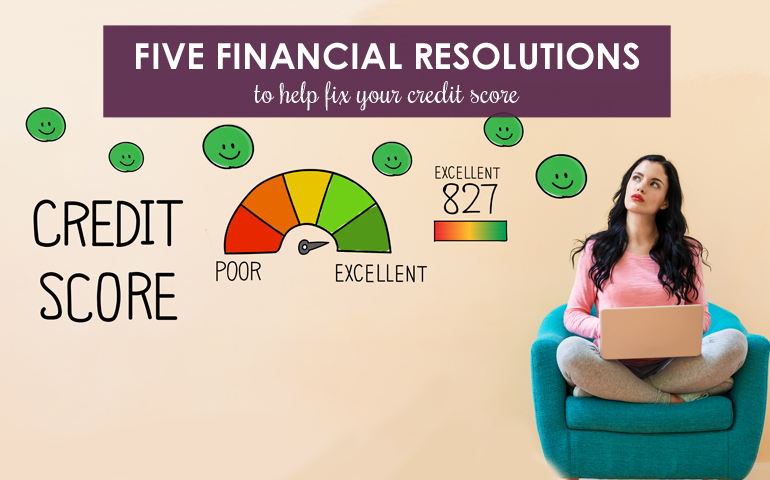 With these five credit-repair tips in mind, you’re on your way to improving your credit score in 2019. Here’s to a financially fit year!